I've been thinking about what to put on our empty walls. I love original art, but it can get pricey really fast (and deservedly so). For original pieces with an affordable price tag, check out my round-up of little hand-pulled linocuts I found on Etsy. 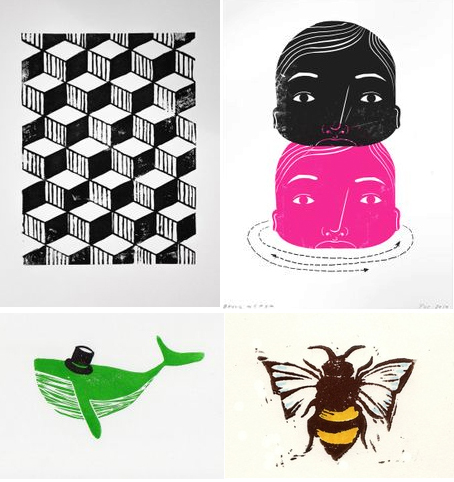 For $30 or less, they're a great way to purchase a small work of art created by a printmaker. See my Pinterest board here. Above: Pattern by Mia The Hawk, Heads by Flat Earth Studio, Whale by We Think Small, and Bee by Art at Garden Corner. You know you need this Bigfoot. And the award for best title goes to Donkeys Disturbed By A Meteor Shower. It'll be very interesting to see what you choose! Do I have to be one of "you guys"? Can't you even tell your mum what you bought?! You know I have trouble with instant gratification!!!! Too bad! :) And you're not gonna like it anyway. Okay, okay! Check your email. Good. That's exactly the effect I'm hoping for. I totally agree with 1and1. My favorite is the quirky green whale. Such a dapper yet adorable animal. The comment section was even better than the post. None of them. A totally different one... Waiting for it to arrive!